Great night of Shiva called Shivratri. 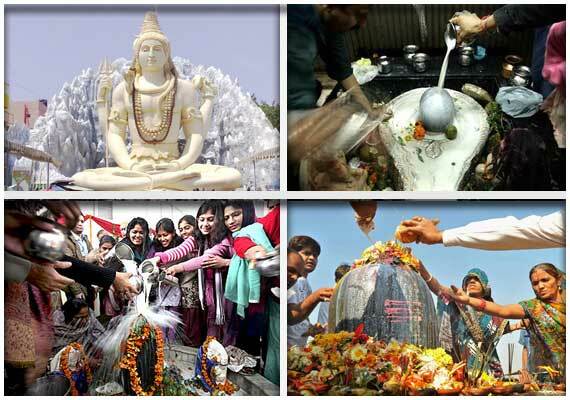 Maha Shivratri is a famous Indian festival. According to Hindu calendar this festival celebrated each year on 13th day of falgun month. In this day lord Shiva married with Parvati. People contain many legends and story of this festival. First is during smunder-manthan devas and damons were search a pot. This pot was emerged in the ocean. This pot poison was capable of destroy whole world and deavas and damons ran to lord Shiva for help. According to one, this festival is celebrated for saved the world by lord Shiva. During the samudra manthan, a pot of poison emerged from the ocean. This poison was capable of destroying the world, and all Gods and demons ran to Shiva for help to protect the world from its effect. Then Shiva drank the poison but held it in his neck not swallowing it. This poison made Shiva throat turn blue, for this reason his name was given Neelakantha. Another legend is once Brahma and Vishnu was fighting who was the superior. The other gods asked shiva for stop fighting of both. Then lord shiva assumed the form of fire in between of them. Then they decided to find one end of supremacy over the other. Punjabiyan Di Shaan – LohriOn Bhagat Singh 84th martyrdom Anniversary Modi To Pay Homage To Bhagat Singh, Sukhdev, Rajguru in Punjab.